Inciting to rebellion or insurrection is an offense without taking arms or being in open hostility against the Government. Incite others to the execution of any of the acts against the government by means of speeches, proclamations, writings, emblems, banners or other representations tending to the same end. 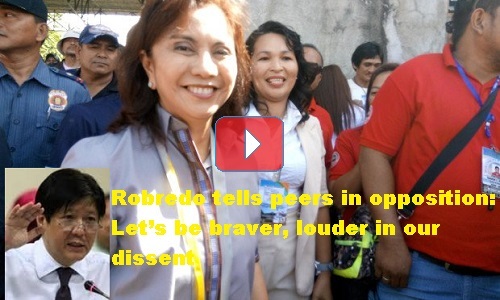 Vice President Leni Robredo’s call to her colleagues in the political opposition to toughen up, be braver, and be louder in their opposition to the Administration’s policies are clearly inciting to rebellion. Robredo distributes paddle boats to fishermen in Bohol when she criticizes the reorganization in the Senate. She sent the message that there are repercussions to senators who do not allow kowtow to the policies of the administration. The blunt message means; lose your committee chairmanship. The message of the reorganization is troubling, she said. You cannot go against the administration. If you do, repercussions are at stake,” she added. She should know the law. Sen. Leila de Lima, a vocal critic of the President is the first to suffer the repercussion, said Robredo. De Lima is now detained in Camp Crame since Feb. 24 after the Muntinlupa Regional Trial Court orders her arrest on drug charges. The Department of Justice clarifies that she is not a political prisoner. The penalty of prision correctional as a maximum sentense and a fine not exceeding 2,000 pesos only is nothing for the Liberal Party to get scared about. This is the reason why they are not afraid of libelling the government using the media, official events, the senate, the church, and in Robredo’s case, her office for such anti-administration attacks.